Managing cash flow is vitally important to the health and growth of any business. In the marine industry it is especially important during commissioning and launch season when there is additional stress on cash needs. Your business management solution should provide you all the tools your business needs to (a) understand how much cash is coming in and how much is going out, (b) determine the timing of cash needs relative to receivables, and (c) actively take measures to change the cadence of your receivables. Make your invoices easy to understand — nothing delays a customer payment more than a bill that is not easy to understand, even when customers have the capacity and willingness to make a payment. You have discerning customers who each have their preferences on how much detail they want to see on their bills. Some want to see copious detail on materials used and technician comments on labor performed, while others prefer summary information. Ensuring that you take those preferences into account when preparing their bill is critical to getting a quick payment. Bill, bill, bill — as a small business, you should bill as often you can. Your billing cadence directly impacts how long you will have to wait for the cash to come in. Cloud based business management solutions allow you to be connected at all times and billing is one activity that you should develop a routine around. Needless to say, your billing process should be simple and your invoices need to be accurate, two things that your business management solution should easily handle. Take advantage of progress billing — for larger projects, progress Billing allows you to bill a customer throughout the life of a project for work done up to a specific date. For example, billing the customer every fifteen days for work completed will create a significant relief on your cash stress. Being able to utilize this powerful and effective tool will not only allow you to keep your cash flow positive but it will also keep you and the customer informed on the progress of the project. Leverage the auto-email capabilities of your business management solution to send invoices and statements to your customers electronically. The faster you bill, the faster your customer has an easy to understand bill in their hands, the faster you can have the cash in your account! Make it easy for customers to make payments — it’s simple, making payments should be as easy as possible for your customers. It takes days for check payments to be received via the postal service and more days for the checks to clear. In today’s self-service economy you have to provide your customers with the ability to make online payments. They do so when they buy other goods on the internet, so why should paying you be “old-school.” It’s more convenient for your customers and you get your payment much faster! Manage to estimates; reduce revenue give-away — you and your team strive to exceed your customers’ expectations, often going above and beyond to please them. You erode their confidence when you surprise them expenses on the bill above what they agreed to. More often than not, owners in that situation will try to negotiate a bill reduction, causing you to effectively give-away revenue. Use the tools at your disposal to manage your projects to the estimates provided. Document change orders and reset expectations related to expense. Clear communication around billing makes business sense and it is the foundation of good customer relationships. Lower your inventory carrying costs — carrying “excess” inventory ties up working capital that could be used to fund operations or growth. But there are other hidden costs as well, such as insurance or the risk that the products may go obsolete (electronics for example). Creating a “just in time” process for acquiring inventory is important – you should leverage past history, your boat component information and job schedule to minimize the amount of inventory you keep on your shelves. 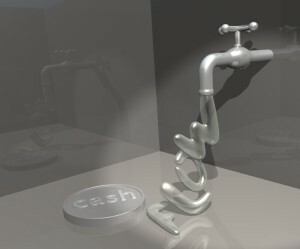 Your business cash flow is one thing that should never be a guessing game. Take the time to leverage the tools provided by your business management solution to really understand the flow of cash throughout your business.